Choose a winning pose: After a victory, hold A, B, C, or D to choose a pose. 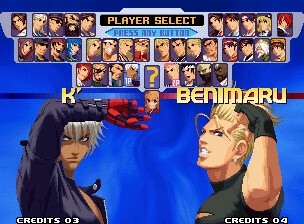 Alternative colors: On Benimaru, Choi, K', Kensou, Kyo, Mai, Mary, Ryo, Terry, Whip, press C+D simultaneously to unlock an alternative color. Maniac Strikers: On the Striker select screen, put the selection on "Another Striker" and enter ↑ ← ← ← → → → ↓ . A new striker appears. This works with the following strikers: Chang, Choi, Iori, Kasumi, Kula, Kyo, Ramon, Ryo. Play Kula Diamond: At the character select, place cursor on the following characters in this right order and press Start each time: Whip, Vanessa, Seth, Maxima, K', then go on the roulette. Then press Start, and enter ↑ ↓ . Kula appears under the roulette.